Seasonal open-air film series have proliferated in the past few years, but none are as diversified or user friendly as Eat|See|Hear. From May through September the Showtime-sponsored minifest screens nearly 20 films at five locations, including La Cienega Park in Beverly Hills, Memorial Greek Amphitheatre at Santa Monica High School, and the Autry in Griffith Park. General admission at the door is $12; the fun begins with afternoon sets by local bands. 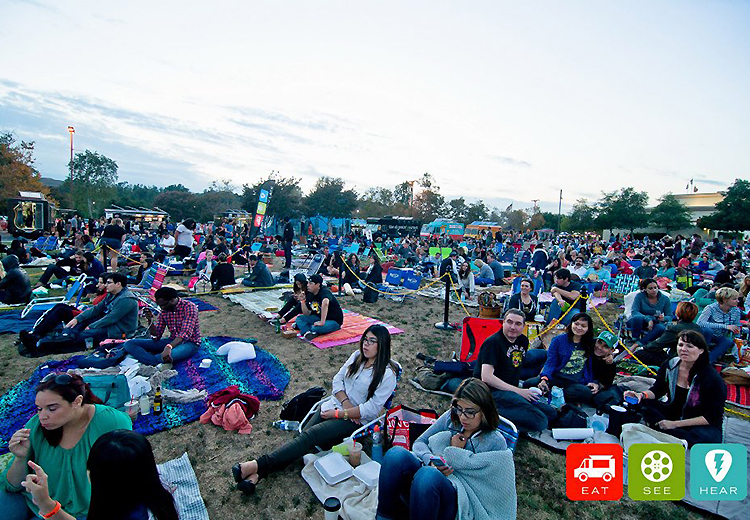 After sampling food from trucks (you can bring your own picnic, too), feast on classics and cult favorites such as Mel Brooks’s western parody, Blazing Saddles, a 30th-anniversary screening of Prince’s Purple Rain, or Quentin Tarantino’s Django Unchained on a 52-foot-wide screen. Canine companions get free biscuits.